An awesome study was just carried out by the folks at Econsultancy and Oracle Marketing Cloud. 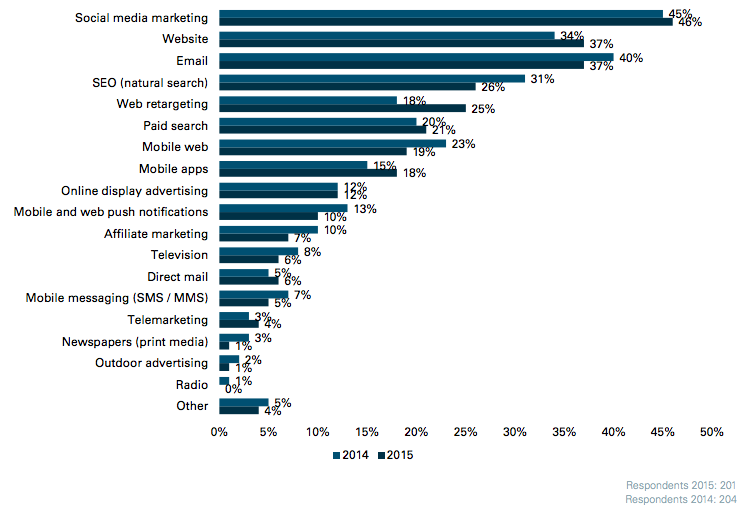 It looked into which marketing channels are prioritized most by marketers. As we’ve mentioned many times before, digital marketing budgets are on the rise, and soon 25% of all ad spend will belong to digital… plus, print media has been on the decline for quite a while now, and that will only continue. In all, there were 182 respondents to the study, a small drop from last year’s total of 223. That being said, results remained quite similar to those from last year, with slight variations. 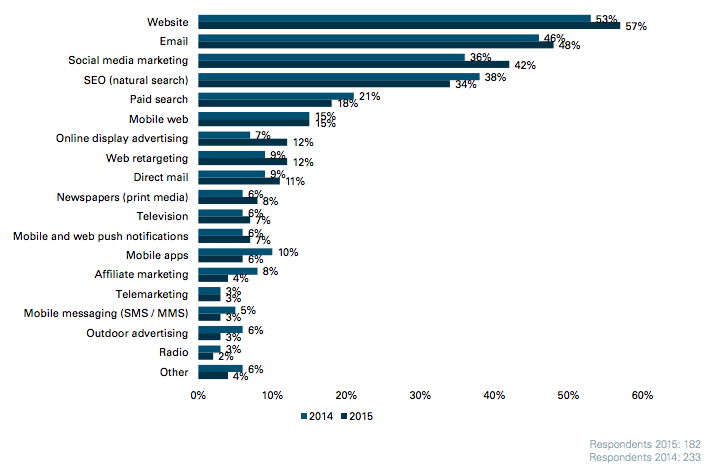 When asked which three marketing channels are the biggest priorities for your organization over the next year, “Website” came in first place, at 57%, going up 4 percentage points from last year. “Email” remained in second place, where it finished last year, but it also went up two percentage points from 46% to 48% in 2015. The only differentiation from last year’s top 3 was in third place, where Social Media overtook SEO, going from 36% to 42% – whereas SEO declined from 38% last year, to 34% this year. Take a look at the full table below! So much of digital marketing revolves around a company’s website, in fact one can argue that it is the ground upon which digital marketing strategy is built. As smartphone adoption continues to increase, and as more and more ecommerce takes place on mobile devices, it comes as no surprise that websites are again the number one channels for marketers. Optimizing one’s website for the mobile experience is essential to marketing these days. As far as email goes, we all know how effective email marketing can be, offering returns of $44 for every $1 spent… so prioritizing it as second to website makes a lot of cents… and sense. Not convinced, well check out this study about how email will never die, because we’re (use humans) too addicted to it. Still not convinced? Well listen here: email has been proven to meet customer expectations 71% of the time it’s used in customer relations! 8 Incredibly Easy Tips for Using Social Media to Boost Your Business’ Sales!